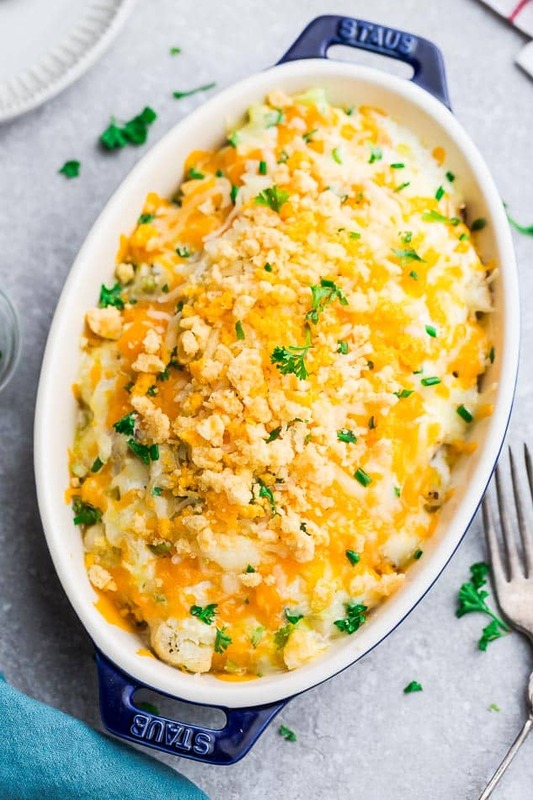 Low Carb Cauliflower Casserole is the perfect easy low carb side dish for busy weeknights, Thanksgiving or when you’re craving comfort food. It’s a healthier and keto friendly alternative with all the classic flavors of a loaded baked potato. Comfort food season calls for cheesy baked casseroles. 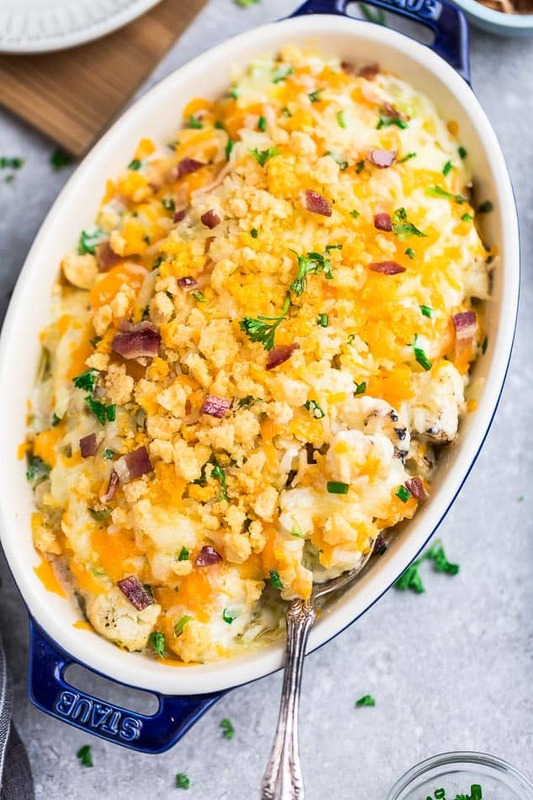 This loaded cauliflower casserole is not only super simple to make but it’s perfect if you’re following a gluten free, low carb or ketogenic diet. 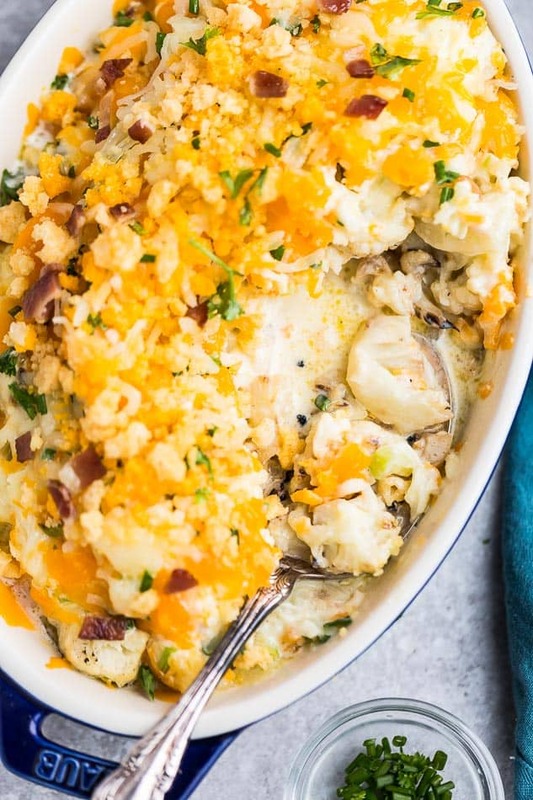 If you love the taste of loaded potatoes and creamy cauliflower au gratin, this healthy cheesy cauliflower casserole bake will totally satisfy those cravings without all the carbs! It’s easy to prepare and perfect if you’re looking to add more low carb or ketogenic Thanksgiving side dishes to your holiday table. Start off by chopping your cauliflower and celery into small florets. Spread onto a large 9 x 13 casserole pan and roast in the oven at 400 F for about 20-25 minutes, or until tender. (Alternatively – you can cook the cauliflower by steaming it in the microwave or in a pot of boiling water). Next, you’re going to make the deliciously creamy cheese sauce by beating the softened cream cheese and sour cream together in a large bowl. Add the salt, pepper, garlic powder and onion powder. Fold in half of the Montery Jack cheese and bacon (if using) then add the roasted cauliflower and celery. Spread the mixture back into the casserole pan and sprinkle additional cheese, bacon and crumbled cheese crisps (if using). Place the pan back in the oven and bake for another 10-15 minutes, or until cheese has melted. Serve hot topped with green onions and parsley, for garnish. 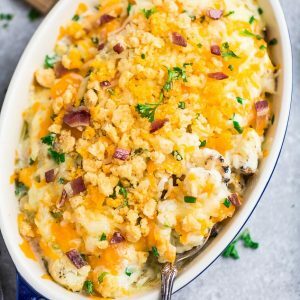 CAN I MAKE THIS ROASTED CAULIFLOWER CASSEROLE VEGETARIAN? Yes, absolutely! If you’re looking for a vegetarian side dish, simply leave out the bacon. 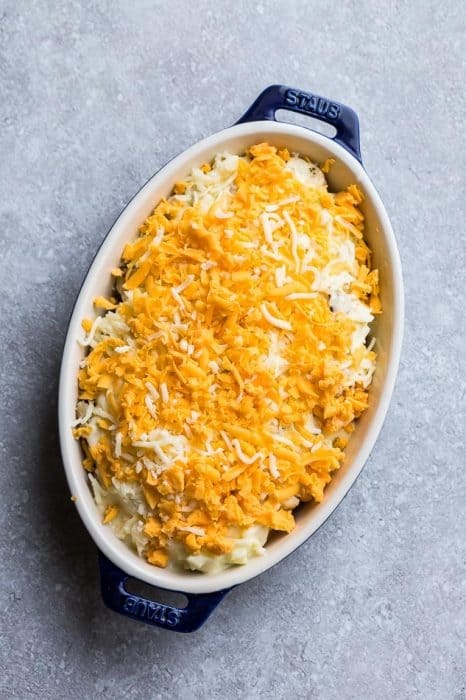 CAN I MAKE THIS TWICE-BAKED CAULIFLOWER CASSEROLE IN ADVANCE? Absolutely! 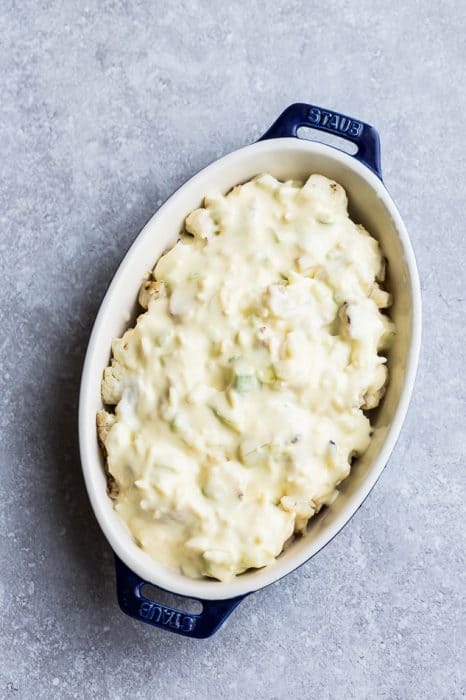 This low carb cauliflower casserole makes a great freezer-friendly dish. Simply cover the casserole pan with a lid and store in the freezer for up to two months. If you prefer to just make a few components ahead of time for Thanksgiving or during the Christmas holidays, you can make the cream sauce in advance and store it in a separate air-tight container. You can also roast the cauliflower a day or two in advance. 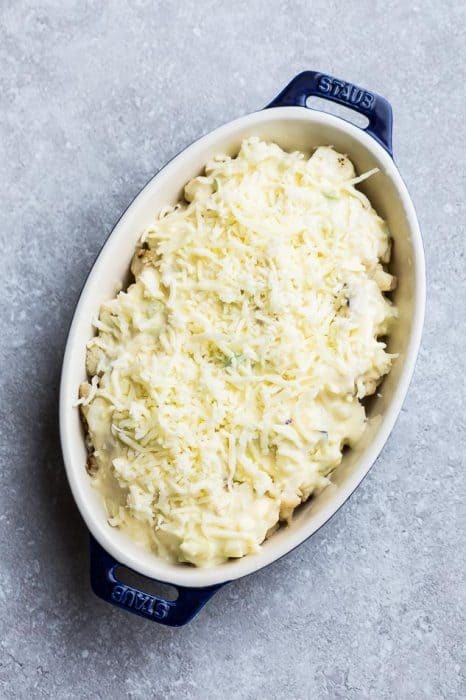 Then when you’re ready to bake, combine the cream sauce with the cauliflower and bake in the oven for 10-15 minutes. 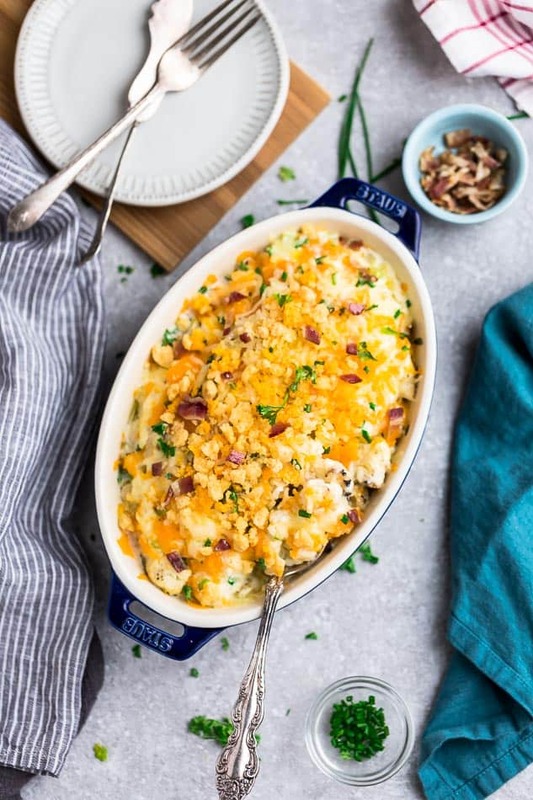 Low Carb Cauliflower Casserole is the perfect easy low carb side dish for busy weeknights, Thanksgiving or when you're craving comfort food. It's a healthier and keto friendly alternative with all the classic flavors of a loaded baked potato. Preheat oven to 400F degrees F. Lightly grease a 9x13 casserole pan and set aside. 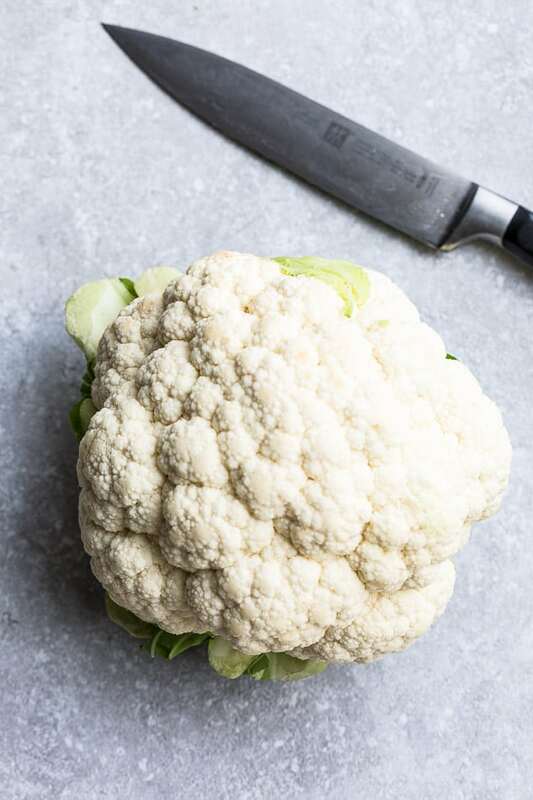 Spread cauliflower and chopped celery in a single layer onto a large baking sheet. Drizzle with olive oil and roast for 20-25 minutes, or until tender. Meanwhile, in a large mixing bowl, combine the cream cheese and sour cream. Beat until smooth. Season with salt, pepper and add garlic powder and onion powder. Fold in half of the Monterey Jack cheese and half of the bacon bits, if using. Once the cauliflower is tender, stir into the cheese bowl until combined. 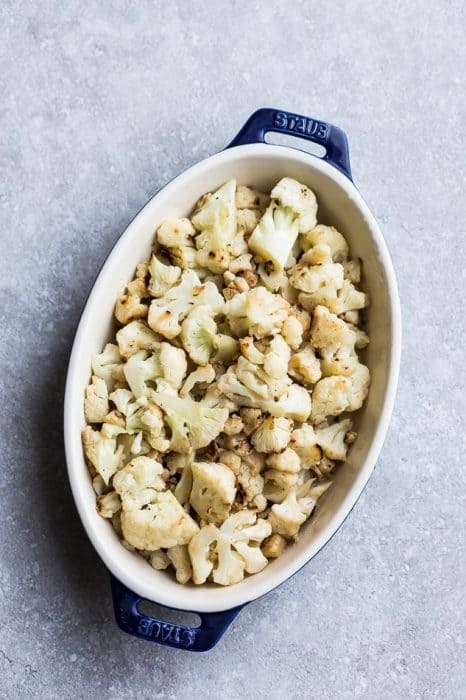 Transfer the cauliflower to prepared casserole pan and spread into an even layer. Sprinkle with remaining Monterey Jack cheese, cheddar cheese and crumbled bacon. Top with crumbled cheese crisps (or crumbled pork rinds), if using. Bake in the oven for another 10-15 minutes, or until cheese has melted. Top with green onions, parsley and serve hot.